BARBERVILLE, FL. (Wednesday, Feb. 11, 2015) – Greg Hodnett has served noticed. His Mike Heffner team will be a force to be reckoned with in 2015. 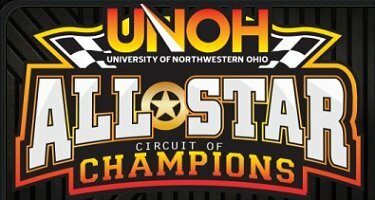 The Thomasville, Pennsylvania driver was able to maneuver through traffic and led all 30 laps at Volusia Speedway Park to claim the University of Northwestern Ohio All Star Circuit of Champions victory. Hodnett’s victory stops a three race win streak for Kerry Madsen. It was the 81st appearance of Tony Stewart’s New All Star Circuit of Champions at Volusia Speedway Park for the DIRTcar Nationals. For Hodnett it was his 19th career series victory and the second All Star win at Volusia for the driver of the Lelands.com/Eagle Steel/Trone Outdoor machine. “We qualified well and got a great run in the dash to put us up front and that helped tremendously. The guys gave me a perfect race car. There were times in traffic where I was hand over hand…it was a handful on the cushion at times,” said Hodnett. “We are working with a new Triple X chassis this year and tried some things and it worked and I got one of these gator trophies,” added Hodnett. Danny Lasoski, who set the fastest lap in qualifications, took second from Paul McMahan on lap 23 but couldn’t catch Hodnett in traffic. “I have to thank Todd Quiring for giving me this opportunity. It’s great to be back with Guy Forbrook and I’m extremely excited for the season,” said Lasoski, who leads all drivers with 16 career All Stars wins at Volusia. “I spun my wheels on the start and that’s what cost me. You can’t give someone like Greg that kind of an advantage,” added Lasoski. Brad Sweet would drive his Kasey Kahne Racing entry into third on lap 23 after having started seventh on the racy half mile. “We missed it a little in time trials and you just can’t do that with the level of talent we have here. It was a great first night for our Ollie’s Bargain Outlets, Avantage health, Sage Fruit, Team ASE car,” said Sweet. “My hands and arms hurt. I have to get in racing shape but I had a lot of fun tonight and can’t wait until tomorrow,” added Sweet. Hodnett and Lasoski would bring the field to green for their 30 lap main event but eighth place starter Joey Saldana would spin coming out of turn four, with most of the field narrowly missing “The Brownsburg Bullet. Donny Schatz and Dave Blaney would also get together in turn one and a red was brought out so that crews could separate the two machines. When the green came back out, Hodnett set sail as McMahan, Lasoski, Kerry Madsen, Sweet and Dale Blaney gave chase. The caution flew on lap two when Cody Darrah and Lucas Wolfe spun in turn two. When the race resumed it would go to the end without stoppage. Hodnett would pull away to a commanding lead while the action for second was heating up between McMahan, Lasoski and Madsen. Hodnett would race into traffic by the 10th circuit. Hodnett would patiently pick off the lapped cars as McMahan and Lasoski were unable to make up any ground. With 10 laps to go Hodnett continued to work through traffic as once again McMahan, Lasoski and now Sweet tried to hunt him down. On lap 23 McMahan tried to drive under a lapped car and slid up the track allowing Lasoski and Sweet to get by. Hodnett would drive to the win over Lasoski, Sweet, McMahan, Madsen, Daryn Pittman (up from 13th), David Gravel (up from 15th), Blaney, Jason Johnson (up from 14th) and Jason Sides would round out the top 10. The New UNOH All Star Circuit of Champions will be back in action Thursday, Feb. 12 at Volusia Speedway Park. Tickets to the DIRTcar Nationals at Volusia Speedway Park are on sale at www.DIRTcarNationals.com. The Volusia events will also be broadcast by DIRTVision on the award winning www.DIRTVision.com. 1. 83-David Gravel ; 2. 98H-Dave Blaney ; 3. 1-Lucas Wolfe ; 4. 51-Paul McMahan ; 5. 7S-Jason Sides ; 6. 7-Craig Dollansky ; 7. 45-Tim Shaffer ; 8. 4S-Danny Smith ; 9. 15H-Sam Hafertepe Jr.
©2015 - Results Provided by: Computer Man Inc.